What a great way to incorporate more veggies in your diet! 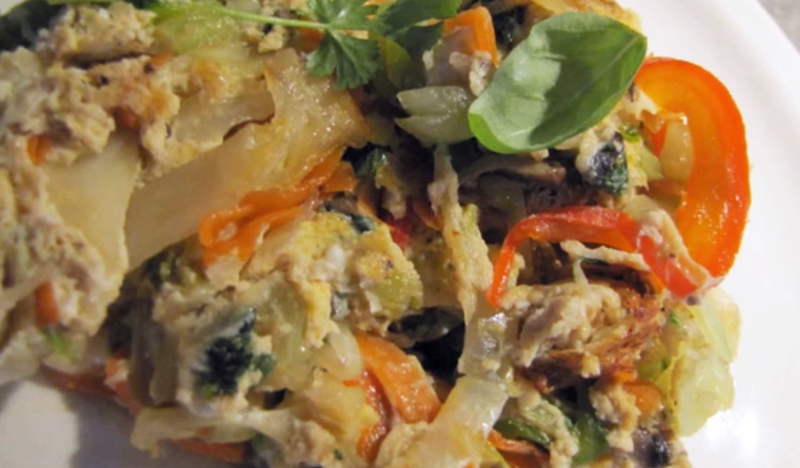 This delicious lightly cooked egg foo young is loaded with bright garden veggies. Great left over and can be eaten for breakfast, lunch or supper. Lightly wilt the veggies in a large pan with a pinch of salt and 2 tsp organic oil or water. Beat together 5 grass fed eggs, 2 tbs of organic teriyaki sauce and some cracked organic black pepper. Flatten veggies out on the bottom of the pan and pour the egg mixture over top. Let cook on medium heat until solid. Flip and cook 2 more minutes. Serve with fresh spring onions and rice or simply eat it alone. We love it for breakfast too!